Sinus infections occur when mucous gets stuck in your sinuses because your nasal passages swell to prevent drainage--a condition that's officially known as sinusitis. Sometimes, colds or the flu can also cause sinus congestion. If your clogged sinuses persist for longer than two weeks or if they are accompanied by other symptoms, like blurry vision, throat pain or coughs that produce yellow or greenish mucous, call your doctor. Otherwise, you may find home remedies as effective as over-the-counter medications for treating clogged sinuses. Spending time in a steamy bathroom can open up your sinus passages and help drain stubborn mucous, William Schaffner, infectious-disease specialist at Vanderbilt University Medical Center, tells "USA Today." Schaffner says a hot shower first thing in the morning can be especially helpful since congestion often gets worse at night. One of the best ways to help heal clogged sinuses is to get plenty of rest, according to the Mayo Clinic. Unfortunately, clogged sinuses may also make it hard to sleep so the Mayo Clinic recommends propping up pillows to keep your head elevated. In addition to preventing breathing problems while you sleep, resting with your head elevated will also encourage your sinuses to drain. The more you drink, the thinner your mucous will get and the quicker it will drain, according to the Mayo Clinic. Drink plenty of water or juice, and MedLine Plus--the online health information resource maintained by the U.S. National Library of Medicine and the National Institutes of Health--suggests hot liquids, like chicken soup, broth or tea. Skip caffeinated and alcoholic beverages, which can have a dehydrating effect. Rinse out your nasal passages by using a saline rinse, recommends the Mayo Clinic. 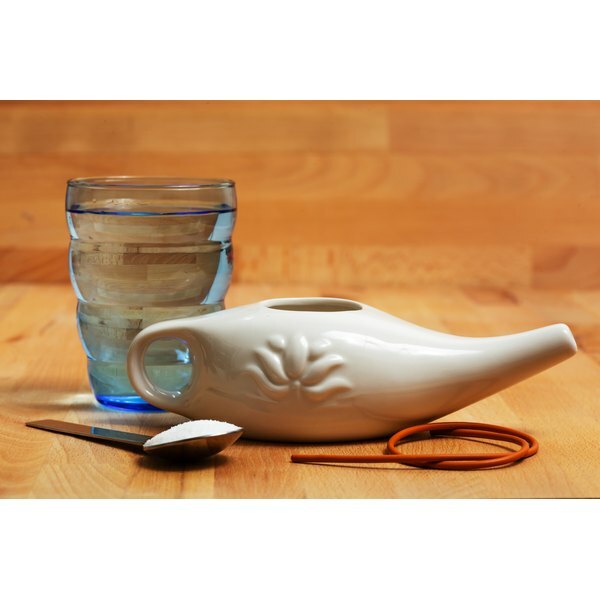 You can use a syringe bulb or purchase a neti pot or specially designed squeeze bottle to push saline solution into your nasal passages and lean forward over a sink to let it drain back out. The saline mix thins the mucous to help it clear faster.